Documentary Drawing as a Research Method? Julia gave us some great tips as to how we could loosen up as part of a warm-up, and especially things to think about to make people less precious about the outcomes of a drawing, which allows us to focus on the energy of the situation rather than on the artefact ending up on the sheets of paper. So consider drawing with both hands at the same time, for a result full of energy (and in my case lots of cross-hatching), not allowing yourself to look back at the paper once you have started drawing, or doing an ‘etch-a-sketch’ by not allowing yourself to let your drawing implement leave the page until you are done. We also talked about considering the paper you are using – and how much more effective a drawing can be if it is backed up by ephemera – a timetable as the background to you documenting a journey, with added tickets, for example. Another thing that we explored was cutting out pictures of people and collaging those together – but turned over, so that we would concentrate on the shape that the human body creates. I have to admit that I didn’t really have time to do this during the workshop, but I was thinking about my previous post and thinking about how documenting workshops can sometimes be tricky if you don’t have the permissions of people to use their photographs. I also think that sometimes then the picture becomes about the people, rather than about the workshop. but what if you just used the silhouette of your participants…? I think this way we could end up with another really interesting ways of documenting a workshop. Something I will attempt to try out soon. 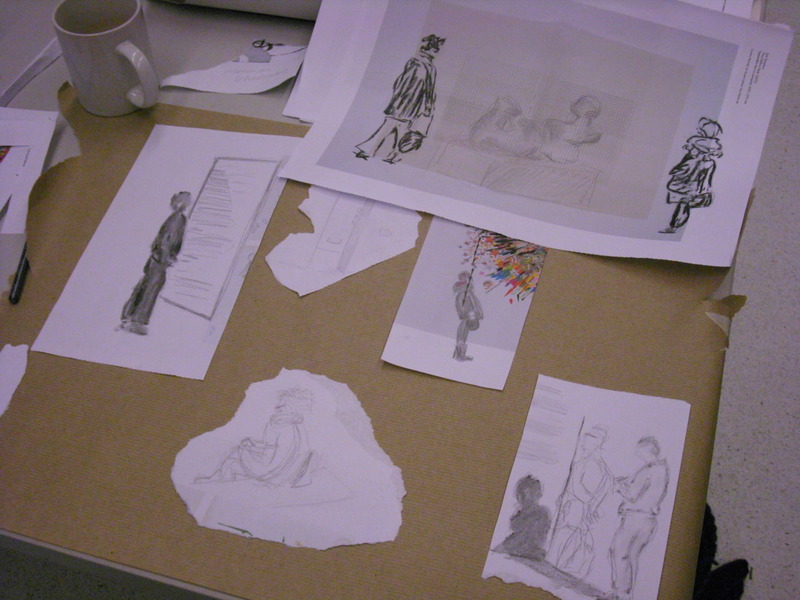 However, what I am probably most excited by is the way I used documentary drawing as a research method in the afternoon. Julia had given us a brief, parts of it was “By closely observing visitors to the Gallery what can the reportage artist discern about the activity of looking at art?” So I found myself sitting in the Tracing the Century exhibition and in the beginning I was randomly sketching people. I found some typical poses, for example there is almost a standard way that men hold their arms behind their backs when looking at art. I and my fellow documentary drawers complained to each other that people never stand still long enough. I decided to ‘follow’ a group around, sketching them whenever they paused in front of art, to see how they interacted – and found that there was an opinion maker, who tried to move the group by moving herself and almost dragging the others with her, while another one seemed to be really interested in the art and tried to linger in front of certain pieces. And then I started tracking visitors’ journeys along one specific wall. Comparing these drawings I realised that people tended to either stop at artworks or at the labels. So I am now wondering whether this form of observation is something I could use to get my students a bit more excited about primary data collection for their research. I think I spent less than an hour in the gallery, but can’t help thinking that this could be turned into more rigorous data gathering, I could develop rules, such as really try to sketch where the visitors stop and pause; the longer they pause, the more detailed/black/intensive the sketch of them should get; trace the ‘motion lines’ on the floor to capture where they come closer or step-away from the work (later put in corresponding motion lines following the whole bodies); prepare a standard background on which to sketch, so that the data can be more easily standardised (possibly superimposed). From this (and a suitable sample), it could be determined whether there really is a distinction between pictureviewers and labelreaders; it could be found out which group is bigger; and possibly whether one spends more time interacting with the art. I made a little book transferring my sketches onto transparent paper to illustrate my mini-findings, which I might show students to get them to consider documentary drawing within their research. 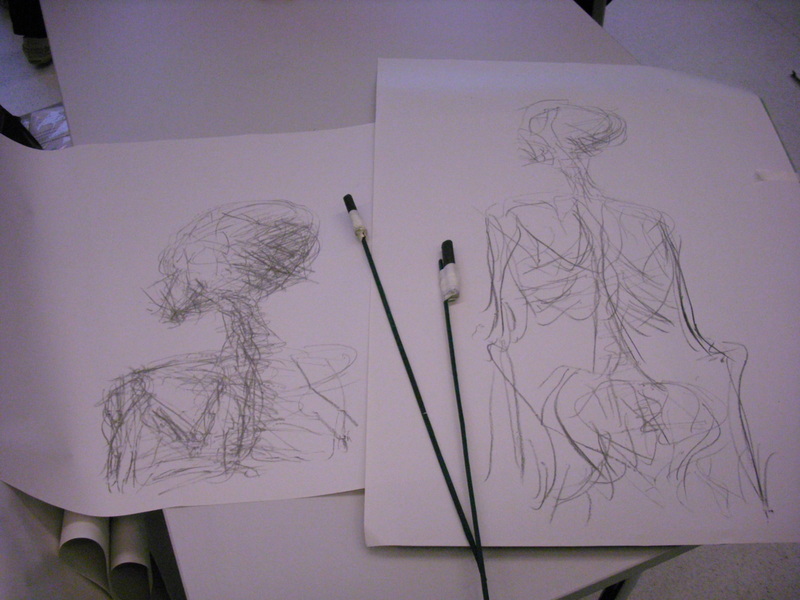 As you can see I was very inspired by the workshop and will be doing more documentary drawing for sure!